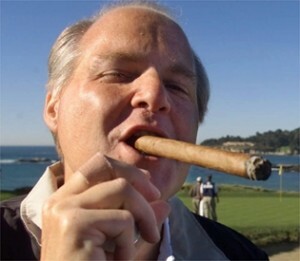 Republican shock jock Rush Limbaugh said Wednesday that New Jersey Gov. Chris Christie’s praise of President Barack Obama has been so effusive, he might just be going gay. In the wake of Hurricane Sandy, which devastated Christie’s state the worst of all, the outspoken Republican who gave a keynote address at the 2012 Republican National Convention has heaped praise on Obama for halting his campaign and ensuring that state and local governments receive all the resources needed to get the recovery underway in earnest. Well, at least he’s just being homophobic today and not racist or sexist. And besides, Michelle is much hotter and certainly in better shape than Christie. In my view, embracing Obama was a brilliant political move by the New Jersey Republican. He is infinitely better positioned in 2016 if Romney loses. Even though he is an ideologue, he can use his high profile work with Obama to show he can reach across the aisle and that he is above partisan politics. That his only goal is to get things done and find solutions — unlike Congress. The genius here is that the issue Christie picked to work with Democrats on is a storm — about as noncontroversial as it gets. He can claim to be moderate, even while not budging one inch on his conservative positions on social issues. Could this man sink any lower? Of course he can! Each year brings new stomach-turning pronouncements from this smacked-out blowhard.